The action of Emergency Exit, a two-act play by Manlio Santanelli, takes place in a place where there should be no action. Two squatters in an abandoned house in Naples wage psychological war on one another as the house, shaken by earthquakes, teeters on the brink of collapse. ANGELO. What you really want is to bury me. You wanna watch me die a painful death! MARTINO. That's perhaps the purpose of our living together. A dream... a vision... a word. Whether you die now or later, easily or painfully, may well depend on me. Thus unfolds a play of comic desolation. Reminiscent of Waiting for Godot, The Caretaker and Who's Afraid of Virginia Woolfe?, yet adding a special, Neapolitan flavor, Emergency Exit lingers between hope and despair, nostalgia and cynicism, enjoyment of life and anticipation of a bad end. The International Daily wrote of the play: "Martino and Angelo are two misfits, two of society's outsiders... All they can do is exchange fantasies and wait for a doomsday that is closer than Godot's arrival... In terms of Italian dramaturgy, Emergency Exit could be as much of an influence as Pinter's The Caretaker was in Britain." The Italian newspaper La Repubblica called the play "a meeting of two exacting theatrical traditions: the grand Neapolitan revival of the commedia dell'arte... and modern-day Europe's cutting-edge, existentialist theater of the grotesque." Eugene Ionesco exclaimed: "Santanelli's work is some of the finest I've seen in years. It is, indeed, extraordinary, intended for audiences who hunger for the rare and the beautiful." Emergency Exit (original title: Uscita di emergenza) won Italy's IDI Award for Best Play; this is the equivalent of the "Tony." It also was named Best Play by the Italian Association of Theater Critics. The Xenos Books edition of Emergency Exit is the play's first translation into English. Translator Anthony Molino has won numerous fellowships and scholarships. 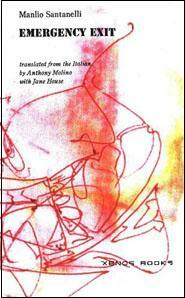 His previous translations include Antonio Porta's Dreams and Other Infidelities (Xenos Books, 1999). Co-translator Jane House has performed in theater, film and television; taught theater, worked as a director and translated from French and Italian.